The global market for truck mounted concrete pumps has been experiencing a substantial rise in its size over the last few years and the trend is likely to remain so over the years to come. The infrastructural developments and the rise in building and construction activities to satisfy the need of the ever-increasing population, especially in Asia Pacific and the Middle East region, is propelling the demand for truck mounted concrete pumps across the world. However, heavy dependence of construction activities on political and economic factors may hinder the growth of this market to some extent over the next few years. The worldwide truck mounted concrete pump market stood at US$2.79 bn in 2016. Increasing at a CAGR of 5.80% between 2017 and 2025, the market is likely to reach US$4.64 bn by the end of 2025. In terms of geography, Asia Pacific led the global market for truck mounted concrete pumps in 2016 with a share of more than 55%. Thanks to the increase in building and construction activities and new commercial and industrial projects the Asia Pacific market for truck mounted concrete pumps is likely to retain its position over the forthcoming years. At domestic level, China is expected to emerge as the dominant market for truck mounted concrete pumps in Asia Pacific in the near future. Apart from China, India is anticipated to witness a healthy rise in the demand for these pumps due to the increasing focus of the government on infrastructural developments in tier 1 and tier 2 cities in the years to come. Among other regional markets for truck mounted concrete pumps, the Middle East and Africa is expected to expand at significant growth rate over the next few years. The rise in the tourism industry, together with advancements in infrastructure, especially in the U.A.E. and Saudi Arabia, is likely to provide momentum to this regional market in the near future. The industrial, residential, and the commercial sectors are the three main end users of truck mounted concrete pumps across the world. In 2016, the residential sector surfaced as the leading end user of these pumps with a share of more than 40%. The segment is anticipated to continue its dominance over the next few years, thanks to the rise in construction activities and the increasing demand for townships projects, specifically in emerging economies. On the other hand, the commercial sector is anticipated to grow at a faster rate than the other two segments over the coming years. The rising trend of urbanization and the advancements in the retail industry are anticipated to contribute substantially to the growing demand for truck mounted concrete pumps in the commercial segment in the next few years. The worldwide market for truck mounted concrete pump is highly consolidated in nature. Sany Group, Liebherr, SCHWING, Zoomlion Heavy Machinery Co. Ltd., PUTZMEISTER, KCP Heavy Industries, XCMG Co. Ltd., Concord Concrete Pumps, Anhui Hualing Automobile Group Co Ltd., Fangyuan Group Inc., Shantui Construction Machinery Co. Ltd., and Alliance Concrete Pumps Inc. are some of the key manufacturers of truck mounted concrete pumps across the world. Truck mounted concrete pump is a construction equipment machine which is used for transporting liquid concrete by pumping. Rising building and construction activities and infrastructure development are the major drivers that drives the growth of truck mounted concrete pump market. Asia Pacific dominates the truck mounted concrete pump market followed by North America and Europe. Countries such as China, India are expected to be the key consumers of truck mounted concrete pump. Middle East is also anticipated to grow at significant rate after Asia Pacific for truck mounted concrete pump market during forecast period. Truck mounted mobile pump is anticipated to be the major segment during the forecast period, and is likely to exhibit high CAGR for next eight years. In terms of end-use, residential held a major share in 2016 and is likely to be dominant market during forecast period. However, commercial is expected to grow at higher rate compare to residential and industrial segment for truck mounted concrete pump market. Rising infrastructure activities in major countries in Asia Pacific and Middle East are expected to offer major opportunities to the truck mounted concrete pump market in the next few years. This report analyzes and forecasts the market for truck mounted concrete pump market at the global and regional level. The market has been forecast based on revenue (US$ Mn) from 2017 to 2025, considering 2016 as the base year. The study includes drivers and restraints of the global truck mounted concrete pump market. It also covers impact of these drivers and restraints on demand for truck mounted concrete pump market during the forecast period. The report also highlights opportunities in the truck mounted concrete pump market at the global and regional level. The report includes detailed value chain analysis, which provides a comprehensive view of the global truck mounted concrete pump market. Porter’s Five Forces model for the truck mounted concrete pump market has also been included to help understand the competitive landscape in the market. The study encompasses market attractiveness analysis, where in product type and end-users are benchmarked based on their market size, growth rate, and general attractiveness. 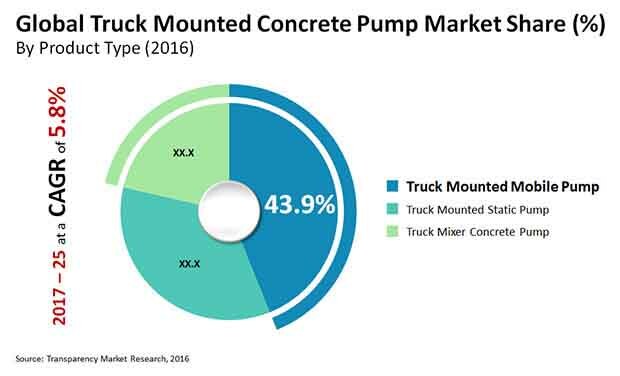 The study provides a decisive view of the global truck mounted concrete pump market by segmenting it in terms of product type and end-users. In terms of product type truck mounted concrete pump is classified as truck mounted mobile pump, truck mounted static pump, and truck mixer concrete pump. Further segmentation is based on End-users such as industrial, residential and construction. These segments have been analyzed based on present and future trends. Regional segmentation includes current and forecast demand for truck mounted concrete pump coatings in North America, Europe, Asia Pacific, Latin America, and Middle East & Africa. The report provides the actual market size of truck mounted concrete pump for 2016 and estimated market size for 2017 with forecast for the next eight years. The global market of truck mounted concrete pump has been provided in terms revenue. Market revenue has been defined in US$ Mn. Market numbers have been estimated based on product type and end-users of truck mounted concrete pumps. Market size have been provided in terms of global, regional, and country level markets. Secondary research sources that are typically referred to include, but are not limited to company websites, annual reports, financial reports, broker reports, investor presentations, SEC filings, Construction magazines, and external proprietary databases, and relevant patent and regulatory databases such as ICIS, Hoover’s, oneSOURCE, Factiva and Bloomberg, national government documents, statistical databases, trade journals, market reports, news articles, press releases, and webcasts specific to companies operating in the market. We conduct primary interviews on an ongoing basis with industry participants and commentators to validate data and analysis. These help validate and strengthen secondary research findings. These also help develop the analysis team’s expertise and market understanding. The report comprises profiles of major companies operating in the global truck mounted concrete pump market. Key players in the truck mounted concrete pump market are Sany Group,Schwing Stetter, Zoomlion Heavy Machinery Co.Ltd., Liebherr, Putzmeister, Anhui Hualing Automobile Co., Ltd (CAMC), Concord Concrete Pumps, XCMG, Shantui Construction Machinery Co., Ltd. etc. Market players have been profiled in terms of attributes such as company overview, financial overview, business strategies, and recent developments.